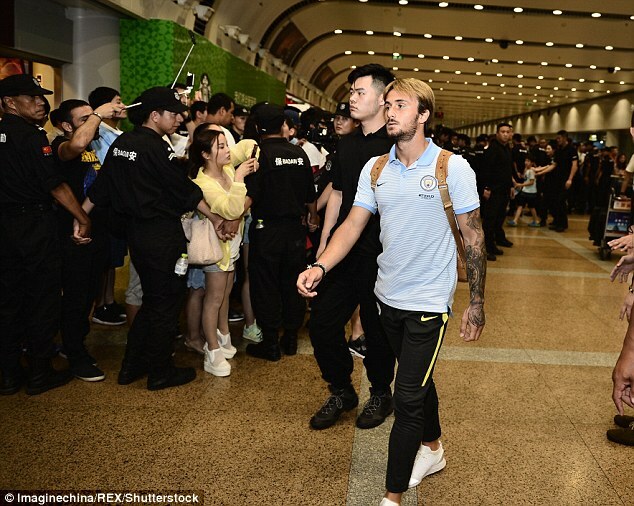 Manchester City have landed in China ahead of their pre-season tour, where they will be facing fierce rivals Manchester United in Beijing on Monday. The likes of Vincent Kompany, Jesus Navas, Aleksandar Kolarov and Wilfried Bony were pictured from the first team, alongside youngsters Tosin Adarabioyo, Aleix Garcia and James Horsfield. 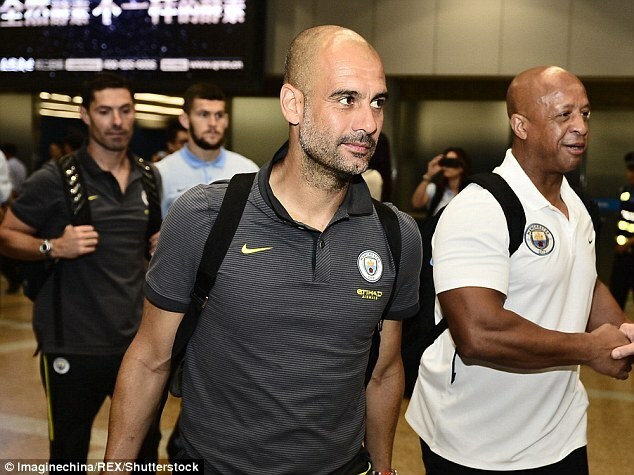 Pep Guardiola also strolled through airport in typically relaxed fashion, as he prepares to face Jose Mourinho for the first time in four years with the early bragging rights of Manchester at stake. Manchester City also face Thomas Tuchel’s Borussia Dortmund on July 28 in Shenzhen, as they look to test themselves against some of Europe’s best ahead of next season. 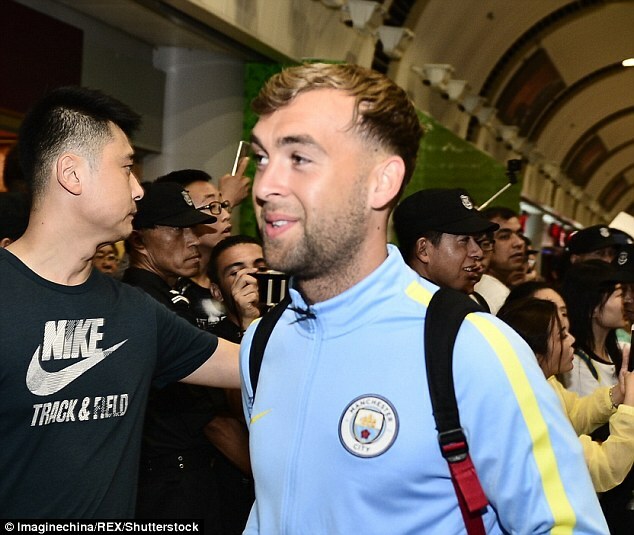 While most members of the first team squad are present in China, Sergio Aguero, Nicolas Otamendi, Joe Hart, Raheem Sterling, David Silva and Nolito will fly out at a later date and begin their own pre-season preparations on tour after they were afford extended leave following their international commitments. The Manchester derby set to be played in Beijing on Monday could be called off with severe thunderstorms forecast to hit China. A United spokesman said: ‘The organisers are working very hard to get the game to go ahead.’ United’s first match against City outside of England is set to be held at the Bird’s Nest Stadium. 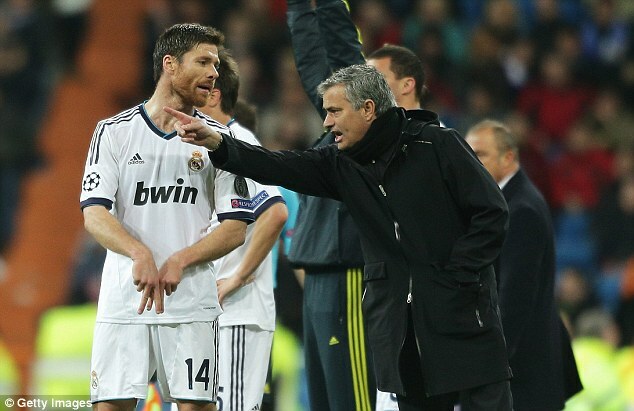 Former Liverpool midfielder Xabi Alonso has given his thoughts on Mourinho vs Guardiola, and having worked under both managers, is excited about what will unfold next season. ‘On the football side, they have different approaches and style. What you get with both is huge charisma and leadership. ‘It is going to be very exciting to watch them, especially in the same city now. It is a challenge for both to be against each other. ‘I am definitely going to be watching it from here and keeping my eye on what is happening.